The Notes feature operates as a separate channel. 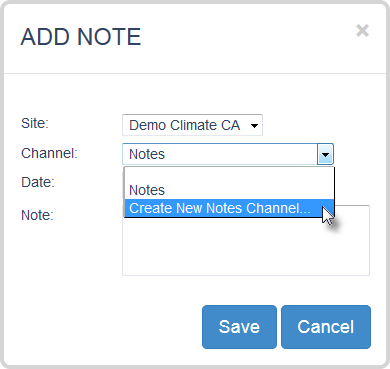 When adding a new note, you will be asked whether you want to create a new Notes Channel or if you want to insert it into an existing Notes Channel. 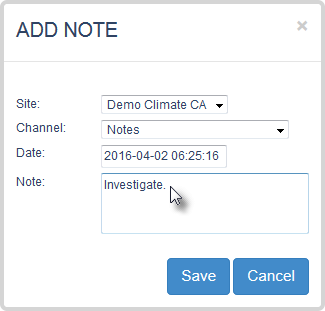 Any existing notes channels will be organized in the Site Explorer under the respective Site. A Notes Channel can be shown in a graph by selecting and plotting it as you usually would with any other channel. 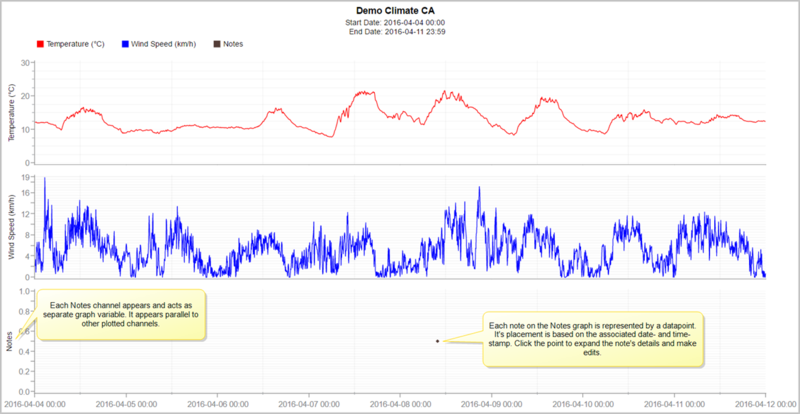 Since notes are stored in a separate channel, they can be exported with graph data as well (either in CSV or XML format). Notes will appear under a separate column; a single note can be found parallel to its corresponding datapoint. 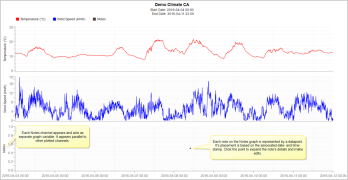 There are two ways to add a note: Either by clicking from the Graphing Toolbar or by right-clicking directly on a graph and choosing Add Note. 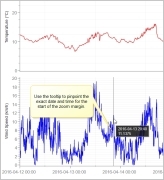 The former method enables you to manually input the date/time; the latter allows you to first locate a datapoint right on your graph and automatically append a date/time stamp. Note: This method of adding notes is only available for Time Series graphs. With your graph open, click from the Graphing Toolbar. The Add Note window will appear. 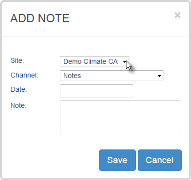 Expand the Site drop-down menu and choose which Site to find/store your Notes channel. 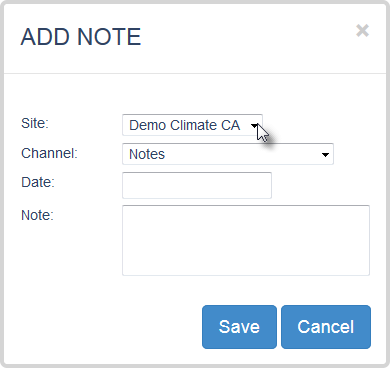 Choose a channel to store your new note from the Channel drop-down list. If the Site already has a designated notes channel and you wish to store your note in this channel, select it. 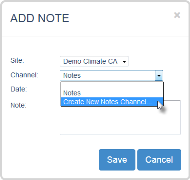 If you do not have a designated channel to store your new note: expand the Channel drop-down menu and select Create New Notes Channel. An additional type-field will appear just below. Input a name for the new channel - typically users title this channel "Notes". 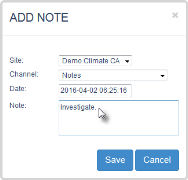 Note: You can have more than one channel designate for storing Notes per Site. If you are creating a new Notes channel, enter a channel name in the type-field – this is where your Note will be stored. Input the date that the Note should correspond to. In the Note text-field, type your Note. Click . The Site Explorer will refresh with your new Notes Channel visible under the Site you saved it to. Locate and select your Notes channel from the Site Explorer. Locate the Site in which your note falls under; expand the Site to reveal channels. Locate your Notes channel and click the checkbox to select it. Click . The Graphing page will reload with the notes channel shown as a parallel graph. Your new note will appear as a point in the Notes graph. You can click the point to expand details. Adding a note in this way saves you time from having to manually include a date and time. With your graph open, hover your cursor over the graph. A tooltip will appear next to your cursor. Locate the date and time you wish to append the note to. Right click with your mouse. A list of options will reveal. Select Add Note. The Add Note window will appear. Choose your Notes channel from the Channel drop-down list. If the Site already has a Notes channel and you wish to store your note in this channel, select it. If you are creating a new Notes channel, enter a channel name in the type-field – this is where your Note will be stored. Upon saving, the channel will become visible in the Site Explorer. In the Note type-field, enter your note. Click . The Site Explorer will refresh. If you’ve created a new notes channel, select it from the Site Explorer and re-plot the graph. Locate the Site in which your note falls under; expand the Site’s list to reveal channels. Now, at the bottom of this list will be your new Notes channel. Click . 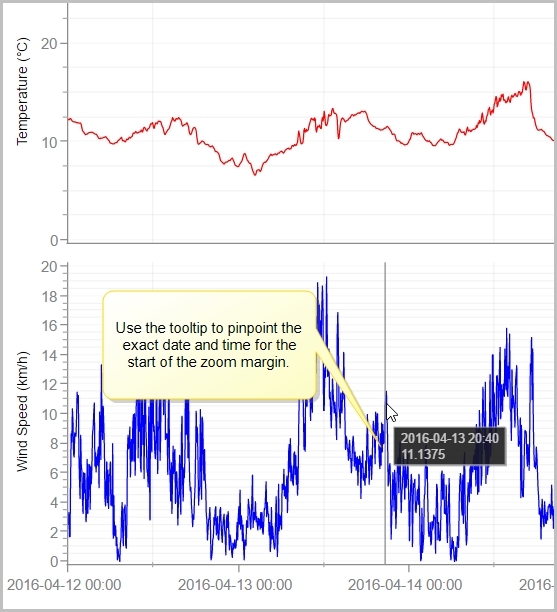 The Graphing page will reload with the notes channel displayed as a parallel graph. Your new note will appear as a point on the Notes Graph. You can click the point to reveal the note’s details. Notes can be appended to Scatter Plot graphs – however, since none of Scatter Plot’s axes relate to time, a notes channel cannot be displayed on/with a Scatter Plot graph. Therefore, the only way to view a notes channel with a scatter plot graph is to export the graph data as a CSV or XML file, where the Notes channel will be shown as a separate column in the spreadsheet. Note: When adding a note to a Scatter Plot, it will not appear with the graph once the note is made. Also, plotting the Notes channel will not make the channel visible. To add a note to a Scatter Plot graph, follow the same directions as you would for adding a note to a Time Series Graph. However, after adding the note, be aware that it will not be visible on the Scatter Plot. Also, plotting the Notes channel will not make it visible with a Scatter Plot graph. To add a note using the Add Notes toolbar button, see "Adding a Note Via the &apos;Add Note&apos; Button". To add a note directly from a graph, see "Adding a Note Directly From a Graph".